HUGE BONFIRES WERE lit in Protestant areas across the North last night to mark the eve of the Twelfth of July. The annual celebration marking the 1690 Battle of the Boyne is a traditional flashpoint between loyalist and republican communities. However, the Orange Order announced last night that it had found a peaceful solution to a dispute over a parade through the republican Ardoyne area. The organisation has not yet revealed its proposal, but said it would make an announcement later, UTV reports. Tensions had risen after the Parades Commission ruled that marchers would have to leave the Ardoyne shops by 4pm. They traditionally pass through the area in the evening. Sinn Féin president Gerry Adams has criticised the Order, saying they refused to meet Ardoyne residents. Meanwhile, the PSNI has said that further violence later today is “not inevitable”, ITV reports. 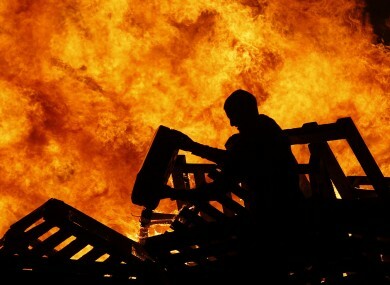 Email “In pictures: Huge bonfires across North for the Twelfth of July”. Feedback on “In pictures: Huge bonfires across North for the Twelfth of July”.